The latest hook IDrive uses in pitching its service is “NSA-proof” backup. With the NSA involved in so many open-source projects, that’s a bold claim. IDrive uses OpenSSL AES and a proprietary key generation technique according to the company. All the best sources indicate that the NSA was not involved in this portion of OpenSSL, so it should be okay. IDrive's Windows interface is pleasant, efficient, and provides helpful tool tips at first run. IDrive backup runs as a standalone application, but when you enable the Sync feature, you get a folder under your user name as you do with Skydrive, Dropbox, and others. Drag any files you want available across devices there and the rest is automatic. I installed the IDrive client for my iPad and it backed up my photos (camera roll) and videos without issues. It also backs up the Apple calendar and contacts, but I use other services for those. Once backed up, your mobile data is available online as well as on your other devices for restoring. A most interesting IDrive feature is its CDP, or constant data protection. When you switch this on (for files sized 500MB or less), files are saved as soon as changes are detected. It’s perfect for keeping ever changing-data safe—the minute you save your file, it will be backed up online. Alas, you’re not allowed to define a subset of data to watch, so it’s all or nothing. It might streamline performance a bit if the program were only comparing to a short list. There’s, of course, also hourly and daily scheduling. IDrive will generate a key, or you can use your own. Either way, the company claims it's NSA-proof. 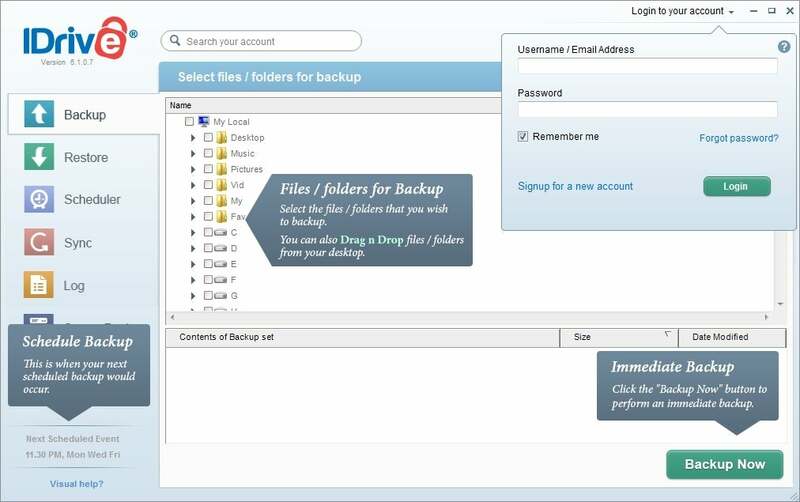 IT types might be more interested in IDrive’s server backup features which include backup of Oracle, SQL Server, SharePoint, and Exchange data. There’s even a brick level Exchange backup that allows you to restore mailboxes without interrupting the service. Also provided is a system-state backup which includes the registry, as well as Active Directory and certificates if the system serves either. For the most part, the Windows client software that I tested worked well, though it had a tendency to grind when I selected or deselected large amounts of data. Indeed, I could hear one of my hard drives being surveyed when this happened, despite the fact that the data I selected was on an SSD. I waited as long as 90 seconds for the program to become responsive after selecting a large repository of files. Perhaps threading the procedure? My CPU has four physical cores and four virtual ones. Please use them. IDrive provides a free 5GB service that also includes an additional 5GB of sync space for devices, but most users have a lot more stuff than that. IDrive’s personal yearly pay plans are highly competitive: 300GB for $49.50, 1TB for $149.50, 2TB for $299.50, and 4TB for $499.50. There are also yearly business plans starting at $99.50 for 250GB and topping out with 125TB for $2999.50. However, please note that those prices are currently being halved. How long this will last is anyone’s guess, and they may simply be the actual prices with a tease ploy. No matter; 300GB of storage for $25 per for all your PCs and devices is a mad deal. 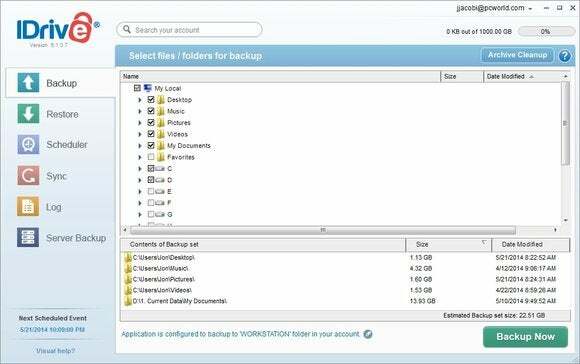 It's easy to select data with IDrive's Windows client, though said client has a tendency to become temporarily unresponsive when dealing with the selection or deselection of large groups of files. A pay IDrive prerequisite is the company’s 3TB physical backup service—i.e., you back up to a 3TB drive shipped to you by IDrive and send it back for safe-keeping. It will be accessible just like the data you upload using the Internet. Express is free for once a year for personal pay plans and three times a year for business plans. This makes backing up large data sets a far quicker proposition. 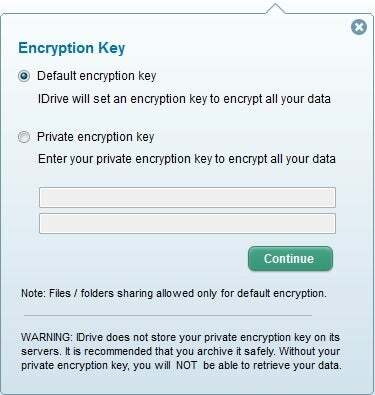 IDrive also provides classic file sharing where you email a link to a file or files so your friends can download them. Backups are incremental to save space and archived, meaning nothing is deleted until you delete it. Aside from the client software’s slothfulness in handling the definition of large data sets, there’s little to complain about with IDrive. It’s affordable, comprehensively capable, has clients for just about every platform, and was pretty darn fast backing up my data. It’s a must-stop on your shopping tour of online backup services.